We still can’t watch Burger King’s anti-bullying ad without welling up, so what could the brand possibly pull off for a follow-up? Turns out, an even more ambitious proposition: Explaining net neutrality in simple terms and only a few minutes. Similar to the staged/documentary style of the previous ads (real customers, fake employees), this new ad sets up a situation designed to outrage Burger King patrons in order to teach them a valuable lesson. In this case, the restaurant sets up “Whopper neutrality,” with options ranging from the “slow-access Whopper pass” of $4.99 (the regular Whopper price) to “hyperfast” at $26.99 (one pricey burger). As Slate outlines, “Now that the FCC has voted to roll back Obama-era net neutrality regulations, internet service providers are allowed to control the speeds at which websites are able to deliver content. Whereas net neutrality rules dictated that ISPs had to treat all content equally, the providers can now charge more to have content load faster, thus the fast and slow lanes.” So in the ad, you can get your Whopper more quickly; you just have to pay for it, highlighting the “slow vs. fast lane” concept. 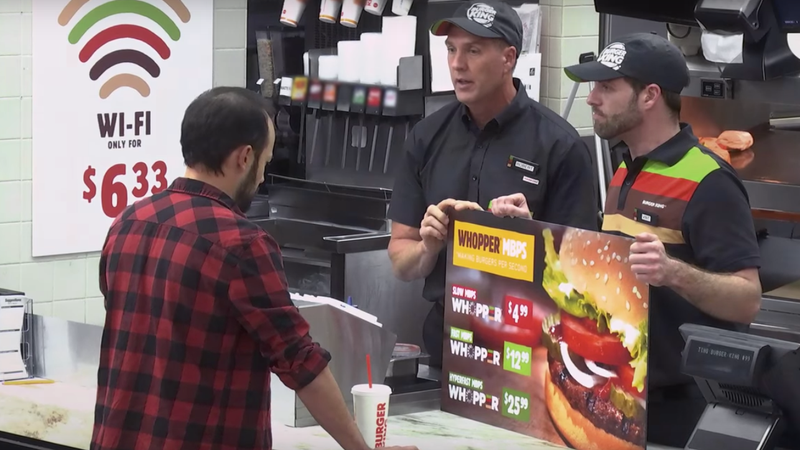 The employees in the ad then tell customers that the Burger King corporation is attempting to push chicken sandwiches over the Whopper, and offer those as an alternative. But that’s not what people came into Burger King for; they want their Whoppers. The BK staff then have to explain to the steamed-up folks across the counter that even though the Whoppers are ready, they can’t hand them out yet, because of the limited access passes. They tantalizing hold the bags away from the hungry people before the correct amount of time elapses and the burgers can finally be delivered. You could say that Burger King is veering out of its own traditional lane by commenting on social problems and problematic policies through its ads. You could say BK is hoping some of this public goodwill rubs off on its Chicken Fries. But we can’t help but applaud a corporation that appears to be using its considerable powers for good.